It’s summer. It’s the slow time in the rare and collectible book biz. It’s the famine part of the feast or famine nature of this business. You just have to work harder and be more creative in your approach to your business. It also helps to be lucky. At the beginning of summer, I got lucky. I got a call from a long-time customer who collects Armed Services Editions (ASEs), those mostly wider than they are tall paperback books given to American GIs from 1943-47. She had not made a buy for a few years, but in the past she had made several large lot purchases. 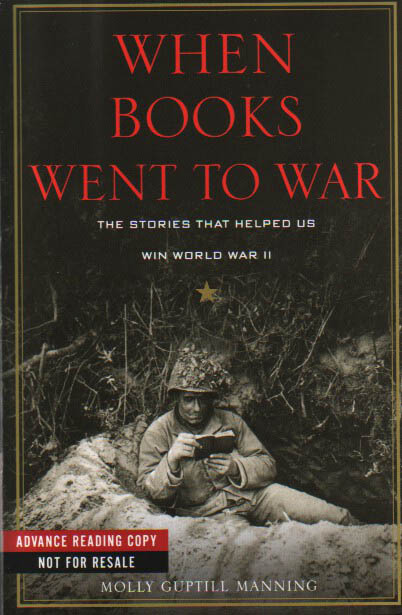 This customer had been reading When Books Went to War by Molly Guptill Manning over the Memorial Day holiday. Molly’s book is a great read about ASEs and the Council on Books in Wartime. The collector in question wanted to buy every ASEs I had in stock. My stock had already been depleted over the preceding months because of new customers and because others had also read Molly’s book, spurring them in to acquiring a few ASEs. At one time I had about 1,100 of these books on my shelves, including duplicates. When this customer made her big buy, I had a few less than 100. She took every one of them. But hey! I’m supposed to be the ASE guy, but suddenly I had none. Cupboards were bare. You would be correct if you said go out and buy some more, but that’s easier said than done. Luckily for me, I know many ASE collectors, both private individuals and institutions. In fact, I have completed two private collections and have filled in a few others to the point that they are just a small handful of books short of completing their collection. I gain a rather significant charge from completing a collection. I’m the guy who places the cherry on top of the sundae, who finally fulfills a collector’s dream of many years. 1,322 is a lot of books. Some of them are seemingly impossible to find. Even long-time collectors sometimes wonder whether the few books they are missing actually exist. They do, but they are awfully hard to find. I approached one of my other long-time collectors. Seems that he liked the idea of consigning me some of his duplicate books. One of them is No. 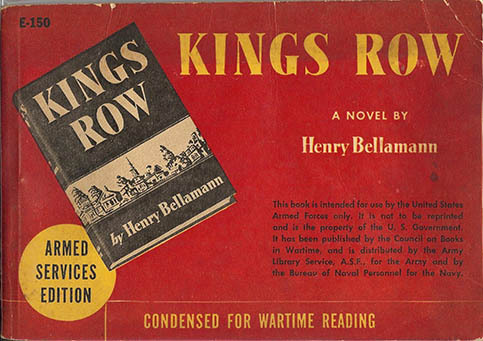 E-150, King’s Row by Henry Bellamann. Some of these E-numbered books are difficult to find, but they really aren’t among the most difficult to find. However, E-150, King’s Row is still on the want list of several of my customers. And I checked my records. In my 35-year career of selling rare and collectible books, I had never had one. Hmmm. One of the institutions that wanted that specific book was the University of Virginia, ably represented by Dr. Molly Schwartzburg, curator of the Albert and Shirley Small Special Collections Library. I had been looking for a copy for her, and the university, for some time. It would be the cherry on top of their sundae. So, guess what showed up in that box of consigned books? Yup, E-150, King’s Row. To say that Molly was thrilled when I offered her the book is a mild understatement. She’s writing her own blog about its acquisition. So now I have completed the ASE collection of an instiutution as mighty as the University of Virginia. But let’s back up a moment. Seems that the University of Virginia had a very good head start with its ASE collection. Back in 1963 it purchased the nearly complete collection of Philip Van Doren Stern. Stern, formerly an editor at Pocket Books, became the general manager of the ASE project, according to long-time ASE collector, ASE expert, and rare book seller Michael Hackenberg, also a member of the Antiquarian Bookseller’s Association of America. Stern’s collection had never been distributed. Thus, that collection was in beautiful condition. But it lacked about 10 copies. Now it doesn’t lack any of them. We know that the Library of Congress has a complete collection. There are two private collections I completed. The University of Alabama and the University of South Carolina are two other institutions that are very close to completing their collections, and there are a couple of other private collections that are nearing completion. It can be done, with a little luck, and some hard work by both bookseller and collector/librarian. Love those sundaes, especially with those cherries on top.